We all like to see a well kept and green lawn through the summer months, our green oasis between herbaceous borders. The heat of summer and lack of rainfall can mean the grass drying out and becoming dormant. How often should you water it? There are other factors that combine to cause the grass to become dormant until more rain falls. If you have maintained a regime of spiking, aerating and fertilising the lawn it should be more tolerant of dry conditions than grass just left to fend for itself. Wind is another cause of the grass drying out. Drought conditions and hosepipe bans may preclude watering altogether but assuming you can water, it’s the grass itself that indicates when it needs moisture, it can look a little dull and is not so springy underfoot. 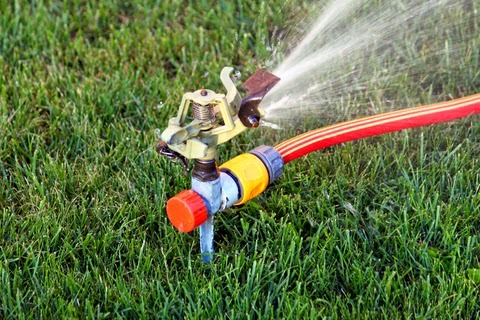 Whereas a soaker hose is recommended for a border, watering the lawn calls for a sprinkler system. If you can avoid it don’t water in the evening because wet grass at night promotes disease. How much watering you need in each session also depends on your soil. Clay will need less water than sandy loam but it’s no good just giving it a light sprinkling. The water needs to penetrate the soil so that the grass roots push down and encourage growth. A handy tip is to place a container in the area you’re sprinkling and time how long it takes to fill to 25mm (an inch) deep which tells when you have watered enough for a sandy soil. Frequently watering with too little water promotes shallow root growth, unhealthy grass and promotes weed growth. Dry weather can also reveal ‘fairy rings’, areas of dead grass in rings right alongside healthy, green grass. Fungus in the soil causes it to repel water and the grass dies back. Spiking and aerating or simply using a garden fork, working from outside the ring inwards will help to return water to the roots. Fertiliser will aid fresh growth and seeding the bare patches helps to return the grass to health. August is a good time to prepare an area for sowing a new lawn and laying turf. See The Gardener’s Journal August 2013.